When the war with Prussia broke out in 1870, Cezanne evaded military service; he was not eager to die for Louis Napoleon and the Second Empire. He hid at first on the family estate in Provence and later in L'Estaque, a small manufacturing town on the Mediterranean near Marseilles. While there, he did this original winter landscape which has more the aspect of twentieth-century painting than of the French art of his time. It is a remarkable example of a space that has been shaped by intense feeling, as in the work of van Gogh a decade or more later. The foreground - the observer's space - is a steep hillside which divides the canvas diagonally in its avalanche descent from left to right down to the sloping red roof, and gives a rushing force to the image. There is no foothold for the spectator, and the trees on this unsteady ground maintain themselves on twisted trunks. To this downward slope of the hill are opposed the rapid recession of the middle field with its rising, converging lines, and the immense horizontal sweep of the overhanging grey clouds. From the dark foliage of the tormented black tree at the left starts another movement of trees descending inward on the crest of the hill and merging with the distant horizon in a single rhythm of declining pulse. The foreshortened diagonal lines in depth are parallel to the diagonal profiles in the plane of the canvas; the sinuous contour of the earth - the whole ground of the scene - is repeated in the form of the great tree trunk and in the amazing zigzag of roof and roads at the right. By these parallels Cezanne unites into a coherent pattern the opposed movements in different planes in depth. The color, too, is a powerful force in holding together the near and far. 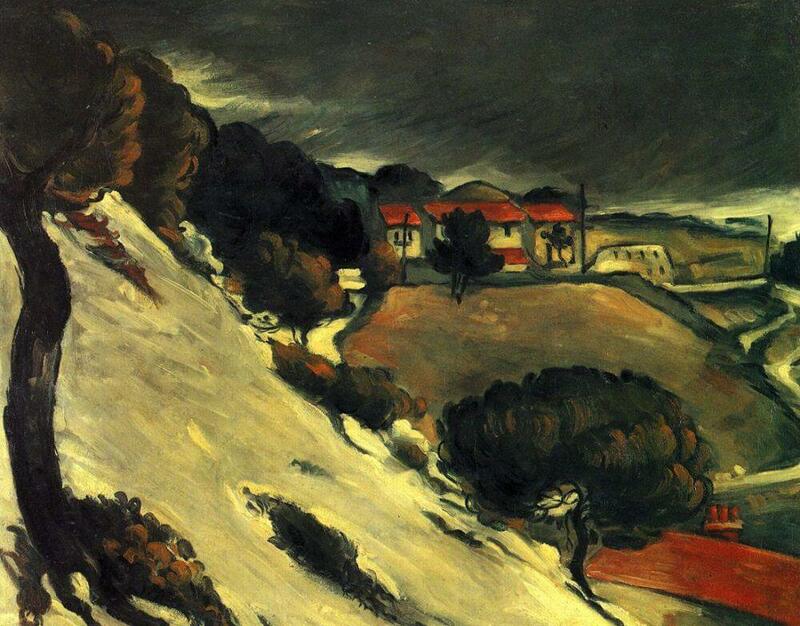 It is obvious in the grouping of the red roofs; but Cezanne also ties the distant sky to the foreground through the cold flashing lights on the horizon - white touches that are skillfully adapted to the adjoining silhouette, forming a minor zigzag halo centered over the peak of a hill which corresponds to the viewpoint of the entire scene. Cezanne has discovered the dramatic in space, an effect of great movements and brusque oppositions. The perspective has an irresistible urgency in the swift flight of lines and the rapid rhythm of change in the diminishing size of things. Color and brushwork sustain the hurricane violence of the scene. A blackish tint permeates the landscape, and even the snow, which in places is a pure unmixed tone, seems a partner of black. Painted in stark contrasts, with an overwhelming, almost monotonous fury - less to capture the essence of a changing scene than to express a gloomy, desperate mood - the picture has some subtle tones: the varying whites of the snow and the many greys, including the warm tones of the middle ground set between the red roofs. The taste for cold black, cold white and grey, seems natural to Cezanne's mood; but this taste presupposes Manet's elegant and impassive art of which the tones and the directness of vision have here been put to emotional use and strangely transformed.